Preheat oven to 375°F. Coat 1-quart casserole with nonstick cooking spray. 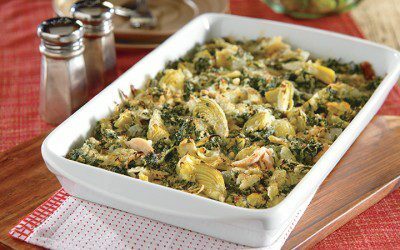 Combine spinach, artichoke hearts, 2 tablespoons cheese, onions, mayonnaise, garlic, and pepper in medium bowl. Place chicken in prepared casserole; top evenly with spinach mixture. Top with remaining 1/4 cup cheese. Bake 30 minutes or until cheese is browned. Note: To make this dish egg-free, substitute vegan mayonnaise for regular. Exchanges per serving: 1/2 Bread/Starch, 2 Vegetable, 4 Meat.